There is a certain slant of light that has intrigued me since I was a little girl. I have a very vivid memory of sitting on the floor in my bedroom, the window was opened and a warm breeze was blowing in. I recall the sunlight leaning through almost in want, it seemed, to touch my face. I was reminded of the verse in the gospel following Christ's baptism when the light from heaven fell upon Jesus' face, "This is my beloved son. . . ." God spoke, "In whom I am well pleased." Even at my young age, I wondered if He was pleased with me, and I recall feeling as though His pleasure surrounded me. Over the years the light often caught my eye, and I always took time to notice, a habit which distressed my mother greatly. I may have spoken to this before. She referred to it as "dawdling" or "lallygagging", and it wasn't tolerated. And so I learned to move at a quicker pace, but always with a tinge of regret for the loveliness of the world that beckoned me. I never cared for hurry, or for the feeling of being rushed. Even as early as my late elementary years, I was very intentional with my time. 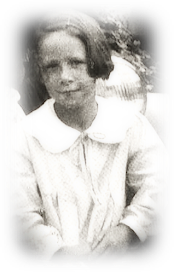 I often set my alarm thirty minutes earlier than was needed so that in the final moments before I departed for school, I would have time to read the next chapter in my current book, or listen to a couple of songs from my latest album, or to simply sit on the front steps of our house and observe. Even in our suburban 70's neighborhood, my eyes were naturally drawn to beauty. But somewhere along the way I succumbed to the expectations and pressures of society. At home, my mother demanded it, at school, my teacher's demanded it, my job demanded it, and once I became a mother myself, multi-tasking became the norm. Time passed at an alarming rate, and with each passing day an angst arose within me which over time led to a season of deep depression. I caved beneath the pressure of all that was expected of me. I was a wife, mother, daughter, employee, school volunteer, friend, and the list goes on. None of which were uncommon roles. My friends bore the same burdens, and spoke of it often. We were all "just so busy", but what was to be done? It appeared as though this was simply the norm, and I began to question how I would survive it. I almost didn't. It took a bit of a break down for me to realize that I am simply not built to withstand the pressures and expectations of what other's may view as "a normal" life". That's not to say that I could or would want to eliminate any of the roles that I fill. My deepest desire was always to be a wife and mother, and I have been blessed to be both. But when I began to look back upon my life, to reflect upon my natural inclination for dawdling, I realized that it wasn't the roles I filled that overwhelmed me, it was the intersecting demands for my attention that often set me spinning. In short, I am simply not equipped for multi-tasking. I like to do things well, and for me that means focusing on the task at hand until it is completed before I move on to the next thing. That doesn't mean that I finish a project in one sitting. I love to crochet, but if I were to make an afghan I certainly wouldn't ignore other duties until it was finished, too many other, more important things would be left undone. But what it does mean is that I try to schedule my days so that for a certain period of time my focus is solely upon adding a few more rows to it. Some weeks that might be daily, and at other times I might not be able to pick it up again for a few weeks. But I try to live in such a way that whatever task I am engaged in is my singular focus until it is time to move on to the next. Of course there are days, perhaps even seasons, when a bit of multi-tasking is required. But I've learned, the hard way, not to allow this to go on for too long. It is essential to my emotional and physical well being to limit multi-tasking, but also to be attentive to the speed at which I work, as well. I don't like to be rushed or hurried, and as much as I loved my mother, as an adult I've embraced my "lallygagging" and my need to live life at a slower pace. 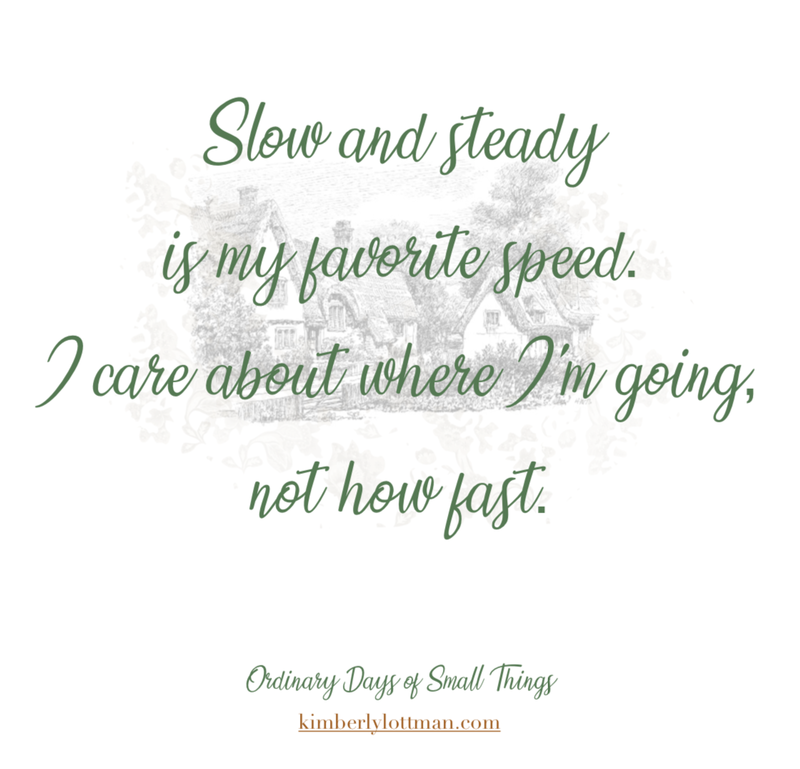 It might sound a little strange, but to be intentional in focusing on one task at a time, and to eliminate hurry and rush, I plan my days in such a way that allows for slow. I know that I am drawn to beauty, and that nature does and always has re-charged me. I don't want to walk past a planter of beautiful flowers and see a honeybee there and not be able to stop and admire it. Bees are one of my favorite creatures. So to allow for that, I build in time to "stop and smell the roses", if you will. If I know I have a margin of time in route to my destination, then the few minutes I allow myself to take in the beauty that surrounds me isn't stressful, and in doing so, I arrive more peaceful and at rest. I can feel, internally, when I've allowed myself to be rushed for too long. It's that old familiar angst, which immediately signals the need to slow my pace, get out in nature, and narrow my focus. I've even learned to voice that need, and thankfully I have a loving family that understands and supports me. They know what "too much" looks like in my life because my lack of it has, unfortunately, impacted theirs. Insert memories of bad mommy moments, here. But thankfully as they have grown to understand my needs, and I theirs, we've all learned a little about the importance of balance. 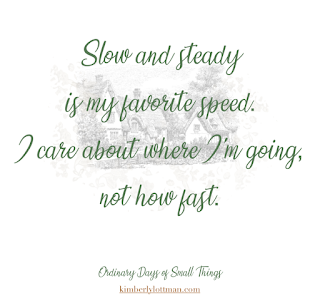 Slow and steady, it's my favorite speed. That's not to say that I don't care about where I'm going or don't see the big picture, I do. But for me that means leaving early, building margin, breaking down big projects, taking small steps towards big goals, and above all, not allowing myself to be pushed by the frantic, fast pace of this world. My priorities. My pace. It's essential to living a life of authenticity. Maybe you feel that familiar angst yourself, even if until now you didn't even realize what it was. I didn't understand what I was feeling for years, and it took me a few more to find a way to find the balance. I admit that I am blessed to be a stay at home wife and mother, which makes single-tasking and "smelling the roses" a bit more doable. 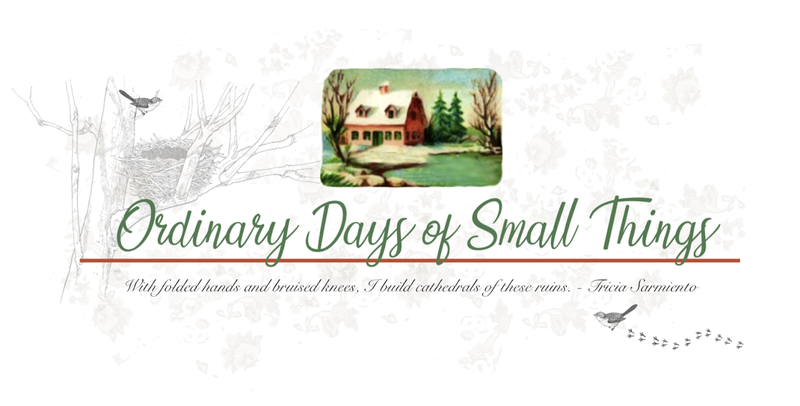 But whether you are raising a family, working hard for that promotion, or whatever the demands of multi-tasking looks like for you, there are some small steps you can take to slow the pace and narrow your focus, and I'd like to share a few of them with you here. My husband loves to watch television, it's how he unwinds. I on the other hand, could go for a month I think and never turn it on. I need quiet to recharge, and would prefer to read or craft in silence or in nature. Whatever your preference, start by focusing only upon what you are doing in that moment. If like my husband you like to unwind by watching your favorite sit-com, put your phone on the other side of the room, close your lap-top and rather than just catching a funny line here and there or finding after thirty minutes that it was just background noise while you were replying to emails, give it your full attention and really enjoy it. The same if you're like me and you prefer a quiet place to read or enjoy your favorite hobby. Eliminate other distractions and engage fully with what you are doing. Pick one thing and give it your full attention, even if that's only for half an hour. Try to do this every day (maybe a long term goal), or at the very least a couple of times a week to begin. I don't know about you but some tasks are just overwhelming, like cleaning out the basement/attic, or spring cleaning, which many of us are about to tackle. Even birthdays and holidays can become overwhelming and so often the demands all seem to hit at the last minute. It stresses me out, and I'm sure it does you as well. Something I have found that helps me combat this is to break it down into smaller chunks. I worked as an educator and later in public relations/event planning in my career-girl years, and it was then that I established a routine of planning six weeks out. I did the same thing when I homeschooled my children. I would begin about six weeks to a month ahead writing lesson plans, or planning the next event. I would start by making a list of all that needed to be done, down to the tiniest detail and then prioritized it.That way by the time we started the next semester or my next big event came up, 90% of the work was done and all that was left in the end were the little last minute tweaks and details to polish it off. I've gotten out of this habit in recent years, and even as I am writing I am reminded of the need for this in some areas of my life. My baby is twenty now, so I no longer homeschool, but even the daily tasks of home keeping can become overwhelming and tasks can sit left undone without a plan. Maybe planning six weeks out is too much, at least for day-to-day housekeeping, but definitely not for holidays or larger tasks. In the world of social media we have so many "friends", it's impossible to keep up. Notifications are pinging every minute, and everyone and everything is vying for our attention. The important thing is to control it and not allow it control you. Recently I "unfriended" close to 30 people on FB and unfollowed over a hundred on Instagram. How on earth I thought I had the time to devote my attention to that many people and products and pages fathoms me. Just KNOWING that I followed that many people overwhelmed me, and to be honest, I'm still a little uneasy with the numbers. So to ease that burden, I remained friends but changed my settings. 90% of my Facebook and Instagram feed are pages and articles and topics on things that interest me and bring me joy, and only about 10% are personal posts written by friends and relatives. I am still friends with them, but to see their feed and what they are sharing means that I have to intentionally click the link to go to their page, and I'll be honest, I don't do it often. I had some friends and even family who seemed a little taken back by my actions. They "enjoy seeing what others are up to", or "just scroll through and ignore most of it", but in the end I had to do what was right for me. I don't, honestly, enjoy scrolling through the day to day details of the lives of more than 100 people. Even half of that is too much for me. I do have a few close friends and family that I enjoy staying in touch with and those are the posts that find their way into my feed. Aside from that there are others that I check in on from time to time, but definitely not daily, and that is how I maintain peace. Even in real life I've narrowed my focus in this season to my family and a few close friends. Bill and I have reunited and are working on our marriage, and that is my first and biggest priority and I give it my my fullest attention. Kate is about to turn twenty and will be leaving home in the not too distant future, so I'm savoring my time with her. I feel called to build into and build up a few other people in this season, and I aside from that, that is about all I have time for. That has meant hard choices and pulling back from friendships that I had been more actively engaged with, but as with social media, it is necessary. Nothing is more important than my marriage and my daughter right now, and for that, I offer no apologies. If you find yourself spread too thin in by social media, I would encourage you to do the same thing. You control it, don't let it control you. Facebook and Instagram can be a good thing, when used properly, and it is good for keeping in contact with faraway family and friends. But even in that, it is not a requirement. As I mentioned, getting in nature, crafting, reading, listening to music, these are all ways that I like to recharge. And while I admittedly have a much smaller threshold than most for burn-out, I've learned to take time to re-charge at the first sign that I am headed in that direction. Otherwise, well, things can get ugly. It isn't isn't selfish to take care of yourself. Jesus leads us by example in retreating Himself, into a boat, into the garden. We all need time alone to engage in and with the things that bring us joy. Even in this, if possible, leave your phone at home, or in another room. I promise, the world will still be waiting when you return. Sometimes when I go for a walk I will take my phone so that I can listen to music, but I've discovered that far too often I find myself in turmoil when I feel that familiar vibration go off indicating to me that someone or something wants my attention, so recently I've started praying during this time instead, and it's been wonderful! I don't mean for that to sound cold hearted or uncaring, but here's what I've discovered. People, even people who mean well, are going to question you. Any time you dare to defy what society deems "normal", everyone is going to have an argument or an opinion. Some will be offended, probably in part because they wish they were brave enough to make those choices for themselves. Some people may even be hurt, which is a sad but unfortunate outcome that may still be necessary. I would encourage you to remain strong in your convictions and allow the Holy Spirit to lead you. In all honesty, you don't owe anyone an explanation for doing what you feel led to do and what is necessary to maintain your peace. Your true friends may not like it, but they will understand and support your decisions, and anyone who doesn't, well, probably isn't a very good friend, if at all. If all you have to give right now is to your marriage and your family, they are your God-given FIRST priority, and everything and everyone outside of that is discretional. Right now I feel led by the Holy Spirit to build up and into one of my daughter's friends, and I am being faithful to that prompting. We also recently began attending a new church and I'm being intentional about building community. With that AND rebuilding my marriage and investing in my daughter, I can easily become wiped out. It's been hard, I've been questioned, and I know that there are some who don't understand, but I'm OK with that. A year ago Bill and I were living separate lives and things were different. I had more time to invest in friendships, and it was wonderful. Today my marriage is better than it has ever been and we are healing and growing closer. and that is wonderful, but I don't have it in me right now for both. Just like the cycles of nature, our lives are "seasonal", too. The Holy Spirit often leads us into change, narrows our focus, instructs us to pull back, and some times, to build in. And the best way I have found to hear His voice and heed His prompting, is by allowing time for quiet. That's pretty counter-cultural by nature because it means single-tasking (making Him our singular focus), and moving at a slower pace. At least, that's the only way it works for me. I'm wired for this and I think more sensitive than most, and yet it is still a struggle for me to find time for quiet. There's a reason God instructed us to, "Be still, and know". You don't get the latter, without the former. Slow and steady, it's still progress, and it brings me peace!